What are your options when you suspect your tenant is committing crimes? One Vancouver landlord has discovered there are no easy solutions. This landlord has been approached by prospective renters who say his tenant is going online and advertising a vacant rental property. Then, she collects a security deposit, but fails to turn over the property. Apparently, she’s done this a number of times. Because the police investigation is ongoing, and the eviction process is slow, even with a 30-day notice, and assuming he can prove he is entitled to an order of possession, it may be months before the landlord can get this tenant out of the property. In the meantime, he felt his only recourse was to go to the news and make the matter public so other renters don’t get cheated. Landlords often are taken by surprise by how long it takes to evict a tenant, and how much money they stand to lose when they rent to a bad one. It’s particularly difficult to oust a renter suspected of criminal activity when the person has not yet had their day in court. Problem tenants are savvy. These tenants know how to delay the eviction process by asking for continuances or taking advantage of long notice periods. The landlord is helpless while the tenant goes months living rent-free. To add insult to injury, the problem tenant may not be caring for the property. Unfortunately, if the person is convicted of a crime, that could make it even more difficult for the landlord to collect past due rent or reimbursement for damages. Part of the problem is the difficulty landlords face in obtaining tenant rental histories. 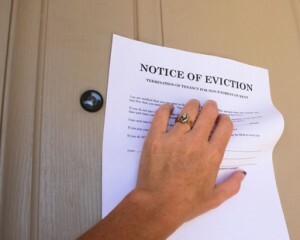 A prohibition on naming tenants who are involved in eviction proceedings is a major hurdle for Canadian landlords, as is the effort required to extract the criminal history of a prospective renter. The legwork involved can discourage any landlord from pursuing a tenant background check, and rely instead on a ‘gut feeling’ they get about the rental applicant. The same people who pull off these blatant scams are quite capable of putting on an act in order to get a place to live. These hindrances are a fact of life for landlords, and the only way to avoid this loss is to be vigilant when screening tenant. In a significant number of cases involving problem tenants, more than one landlord was impacted. That’s why it is so crucial to perform a tenant background check, including verifying identity, running a credit report, and checking landlord references, before signing a lease agreement. This Vancouver landlord certainly has a lot to tell you about his current tenant! It may seem that the credit report or credit score only reveal if the person is financially sound or could take out a loan. But the credit report can also raise red flags by providing some overlapping information about employment, previous addresses, or identity that might conflict with something the applicant said or wrote on the rental application. Remaining vigilant in the tenant screening can trip up even the best professional tenants. They think that you won’t check them out, but you can prove them wrong.